The two oil-producing platforms in Arctic waters. ENi’s Goliat or Gazprom Neft’s Prirazlomnaya? The prices are low and the industry haunted by dismissals and shrinking revenues. But production is still proceeding with full steam both in Norwegian and Russian Arctic waters. 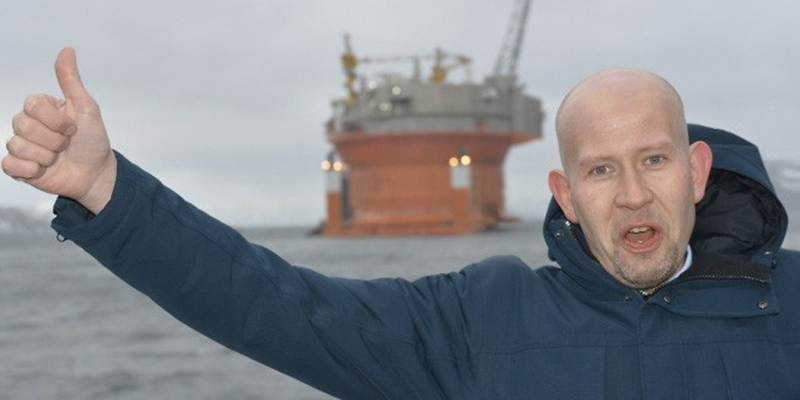 Norway and Russia each have one offshore Arctic oil field in production. The Goliat is located about 80 km northeast of Hammerfest, the Norwegian Arctic town, and the Prirazlomnaya in the Pechora Sea, about 60 km from the Nenets coast. ENI Norway started production at Goliat in March this year, and the first tanker with Goliat-oil left the field late that same month. The field, which holds about 180 million barrels of oil, is run by a Sevan 1000 FPSO, a floating, cylindrical production facility. Company representatives now say to NRK that tankers loaded with 850,000 barrels of oil every 8th day depart from the installation and that daily production has reached 100,000 barrels. That is significantly more than at the Prirazlomnaya. According to Gazprom Neft, the field now produces 6,000 tons (44,000 barrels) per day. That volume is gradually increasing. In year 2020, the company intends to reach peak production of more than 13,500 tons (100,000 barrels) per day. That means that the two installations ultimately will produce about the same volumes of oil. However, Prirazlomnoye has far bigger reserves, 70 million ton (513 million barrels). The Prirazlomnaya is operated by Gazprom Neft Shelf, a subsidiary of Gazprom. It started production in December 2013. Two specially designed ice-breaking tankers, the “Kirill Lavrov” and the “Mikhail Ulyanov” bring the oil from the platform to the floating terminal tanker «Umba» in the Kola Bay. Climatic conditions at Goliat differ significantly with the ones in the Pechora Sea. While the waters are open all through the year in the Norwegian Barents Sea, they are covered by thick ice in winter in the Pechora Sea. Consequently, while the Goliat is based on the use of a floating production facility, the Prirazlomnaya applies a stationary, Arctic-class ice-resistant platform, the world’s first of its kind. The Goliat platform is manned by about 40 people, while the Prirazlomnaya has a personnel of about 200. Both projects were significantly delayed. After a long period of construction at the Sevmash yard, the Prirazlomnaya was in August 2011 towed to the Pechora Sea. However, it took almost another 2,5 years before the installation could start production. The whole project is believed to have cost Gazprom Neft 90 billlion rubles (€1.24 billion). Also for ENI, the Arctic adventure turned into a nightmare-like story. The Italian company originally planned to start production in the project in 2013. However, Norway’s Petroleum Safety Authority formally approved the use of the Goliat platform only in January 2016. Construction of the platform in South-Korea was long delayed and costs overrun are estimated to NOK 17 billion (€1,8 billion). The total price tag for the project is now NOK47 billion (€5 billion). None of the two projects are making much money these days. Norwegian experts previously argued that ENI needed more than $95 per barrel to break-even. Likewise, Russian oilmen in 2014 argued that Gazprom Neft needed an oil price of a minimum of $80 per barrel to make profits in the project.